November 11, 2002 saw the culmination of two year's hard work by the staff of the IDP China and UK offices to prepare a Chinese IDP web site hosted at the National Library of China. The site (http://idp.nlc.gov.cn) went live on the morning of 11 November giving access to manuscripts held at the National Library of China and the British Library through a Chinese interface with a Chinese search facility. The English site was relaunched at the same time with a redesigned interface and greater functionality. 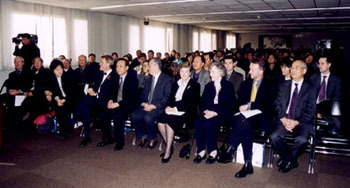 The launch ceremony, organised by and held at the National Library of China and attended by over 100 guests, was captured on film by several Chinese TV stations and reports also appeared in the Beijing and national press. Dr Lynne Brindley, Chief Executive of the British Library, flew to China to attend the launch and gave a short address at the ceremony following that of Mr Ren Jiyu, Director of the National Library. Also present were Mr Zhao Weisui,The Chinese Vice Minister of Culture, Stephen Bradley, Minister at the British Embassy in Beijing, Anne and Cyril Ely of the Sino-British Fellowship Trust, primary funders of the IDP China Project, Lady Pamela Youde, patron of IDP and Dr Abraham Lue, Chair of IDP, as well as leading Chinese scholars and representatives from the Dunhuang Academy. 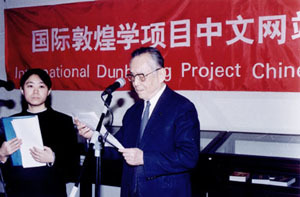 Thanks must be extended to the National Library of China for their work in making the launch so successful and to the British Council in Beijing for their help and support: this included funding a bound edition of the first twenty issues of IDP News. The National Library of China, by its eagerness to cooperate in making the Dunhuang manuscripts more accessible and its hard work over the past two years, provides a excellent example for others to follow. IDP will now work closely with other institutions holding Dunhuang manuscripts to work towards making all the manuscripts available online. At present, about 20,000 images per year are being added to the database, along with catalogue records, bibliographies and other scholarly resources. Stockholm was the venue for the Fifth Conservation Conference, jointly hosted by the Royal Academy of Letters, History and Antiquities and the National Museum of Ethnography, with additional support by the Sven Hedin Foundation of the Royal Academy of Sciences and held from 17-19 October, 2002. The first day's proceedings were held in the intimate and delightful surroundings of the privately-donated home of the Royal Academy and, after an excellent afternoon of presentations on paintings from Kharakhoto and Dunhuang, ended with a dinner hosted by the Royal Academy. For the second day delegates moved to the National Museum of Ethnography and heard presentations on conservation and scientific analysis of paper (before lunch) and of texiles (after lunch). The afternoon ended with a tour of the museum and a film about Sven Hedin's 1927-8 expedition, 'With Sven Hedin in Central Asia', followed by a buffet dinner hosted by the Sven Hedin Foundation. The final day covered the issues of digitisation for access and ended with a discussion of future conferences and initiatives. Professors Hakan Wahlquist and Staffan Rosén were excellent organisers and hosts and their hard work and charm combined to make this and excellent, productive and very enjoyable conference. It is planned that at least some of the papers (titles listed below) from the conference will be published in due course (details to be given in IDP News). There will be a one-day conservation conference as part of the Otani commemorations in Kyoto in September 2003 (see Conferences below) and the National Library of China has been asked to host the next major conference, currently planned for spring 2005 in Beijing. Right:Chief Executive, Dr Lynne Brindley, gave a lecture on digital libraries to staff, students and scholars at the National Library of China. 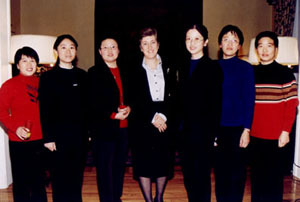 She is pictured here with some of the audience. Lin Shitian: 'A significant contribution to the digitisation of Dunhuang manuscripts at the National Library of China.'. Thanks to the collaboration of the British Museum (BM) and the Freer Gallery, many of the paintings found at Dunhuang are now also available on the IDP web database. In order to show the paintings at a size at which detailed study is possible, IDP displays them on a slightly different page from the manuscripts, without a thumbnail and with one main view. The medium-sized image is sized to show the whole painting in some detail but, for further study, users can look at the large image. Details of the larger images are now also being prepared and these will be available shortly by clicking the 'More Images' button above the medium image. 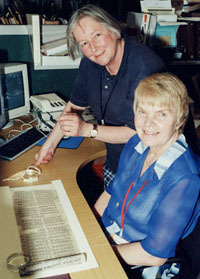 Further indexing and cataloguing information is also being added and should be available during 2003. 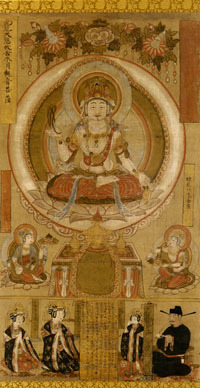 The BM images were originally digitised thanks to a grant from the Mellon Foundation and will be used on the Mellon International Dunhuang Archive (MIDA). The original images are available in the BM Student Room (by appointment) at very high resolutions and a selection are also on the BM Compass web site (http://www.thebritishmuseum.ac.uk/compass/). The BM will launch a new website next year to show all of its paintings. It is now starting to digitise some of the 3D Stein material for MIDA and this will also, over the next couple of years, be made available on the IDP web site. Many of the paintings and artefacts from the British Museum will be on display at next year's British Library exhibition: 'The Silk Road: Trade, Travel, War and Faith.' Running from April to September 2004, the exhibition will showcase over 200 items from the Stein collection at the British Library, British Museum and National Museum, New Delhi, as well as a selection of objects from China, France, Germany and Japan. 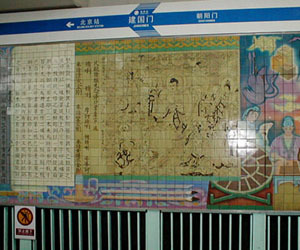 ... and the Diamond Sutra.Paintings The walls of Jianguomen subway station in Beijing (above) are decorated with icons of Chinese history and culture, among them the earliest dated printed book in the world, the Dunhuang copy of the Diamond Sutra dated to 868 AD. To see the whole document go to the advanced search page of the IDP web database and type 'Or.8210/P.2' into the pressmark search box. Left:Group portrtait in the camp at Gandarbal on the 1909 Karakorum and Himalayan Expedition. 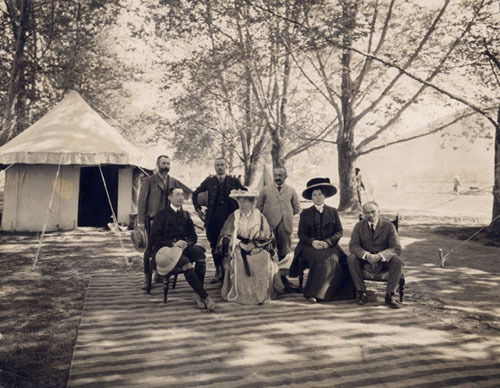 Shown from right to left: Sir Francis Younghusband, Mrs de Filippi, Count Filippo de Filippi, Helen Younghusband, Merchese Negrotto, Duke of the Abruzzi and Vittoria Sella. Photography courtesy of the British Library, Mss Eur F197/653(59). Count de Filippi studied medicine and his vacations from his appointment at Bologna were spent acquiring considerable mountaineering skills in the Alps. In 1897 he was invited by the Duke of the Abruzzi to join the expedition to Mount St. Elias in Alaska. He reached the summit and, on his return, published his account. His marriage in 1901 to the American poet Caroline Fitzgerald did not curtail his travels and over the next decade he went to the Caucasus and Bokhara. In 1909 he again accompanied the Duke, this time to the Karakorum and this inspired him to mount his own expedition back there in 1913-14. The scientific results of this filled sixteen volumes, published between 1922 and 1935. Their friendship survived until de Filippi's death in 1938, de Filippi envying Stein's continued travels as a combination of ill health and lack of financial support prevented him from further forays into the mountains. His obituary in The Times said that his friendship with Stein was one of the two things he valued most highly in life. Both nieces still live in Florence and last year, through the kind introduction of Giovanni Caselli, I had the opportunity to visit Pia — now Lady Passigli (pictured above) — and to read Stein's letters to her uncle. She gave as warm a welcome as her uncle and remembers well Stein's visits, his friendship with her uncle and his kindness to her and her sister. Giovanni Caselli is now working on an exhibition and book about de Filippi's life and expeditions, to be held in Italy later this year and it is hoped that this will bring de Filippi the recognition he has long deserved as one of the great explorers of his age. The Geographical Journal XCII. 6 (Dec. 1938). Stein MS. 424/26/f.12, Jan. 1935. Stein MS. 424/8/f.57, Nov. 1912. La spedizione di Sua Altezza Reale il Principe Luigi Amedeo di Savoia, Duca degli Abruzzi al monte Sant'Elia. Alaska, 1897, Milan: U. Hoepli, 1900; 2nd ed. Turin: CDA 1996; translated into English as The Ascent of Mount Saint Elias, Alaska, London, 1900. La spedizione nel Karakoram e nell'Imalaia occidentale, 1909, Bologna. N. Zanichelli. 1912: translated into English as: Karakoram and Westerm Himalaya 1909: An Account of the Expedition of H.R.H. Prince Luigi Amedo of Savoy, Duke of the Abbruzzi, Constable and Company, London 1912. Relazioni Scientifiche della Spedizione De Filippi nell'HimÀlaia, Caracorùm e Turchestan Cinese (1913-14), 16 vols., Bologna 1922-35. Storia della Spedzione Scientifica Italiana nel HimÀlaia, Caracorùm e Turchestan Cinese (1913-14), Bologna, 1923: translated into English: The Italian Expedition to the Himalaya, Karakorum and Eastern Turkestan (1913-1914), Edward Arnold and Co., London 1932. An account of Tibet. the travels of Ippolito Desideri of Pistola S J, 1712-1727, (ed. ), Routledge, 1932. 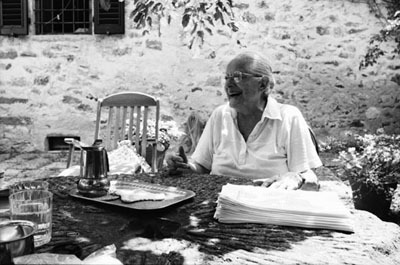 Susan Whitfield is preparing a longer article based on the correspondence between Stein and De Filippi and will also cover their friendship in more details in her forthcoming book, Aurel Stein and the Silk Road (The British Museum, 2004). We were all shocked and deeply saddened to hear that Ksenia Kepping had died on 13th December 2002. She had spent several months in the British Library over the last few years, working, as only she could, on the Tangut fragments found by Stein in Kharakhoto. Ksenia was not only the foremost Tangut scholar in the world, a distinguished sinologist and excellent linguist with beautiful English but also a woman of great distinction and personal charm. She is a loss to the scholarly world but also to her many friends and admirers. I first met her about 12 years ago when she made a brief visit to London from Leiden where she was a visiting academic. She came to the Oriental and India Office's temporary library in Orbit House where the Tangut manuscripts were housed with the rest of the Stein collection. Very little work had been done on the manuscripts since Eric Grinstead, then Assistant Keeper in charge of the Chinese collections, had published two brief notices in the British Museum Quarterly in the 1960s 1 so I was very keen to meet a Tangut specialist. I was quite unprepared for Ksenia's elegance and warmth. We went out for lunch together and this was the first time I heard some of her extraordinary life. I seem to remember speaking Chinese but it may be that we were just talking about Tianjin where Ksenia grew up. She spoke Chinese wonderfully with a good northern accent. Though her life sounded interesting and exciting to me, it had not been easy for her. I learnt that her parents were refugees in Republican China and the family was eventually ordered back to the eastern Soviet Union. Ksenia was particularly proud of her uncle, the last Patriarch of the Russian Church in Peking who had locked his church up for safe-keeping and handed the keys to the authorities. Despite his scrupulous honesty, he was vilified by atheist Communists, and Ksenia felt very strongly indeed about this injustice. In many ways, however, she did not dwell on the past. She was amused to revisit Tianjin and see the house where she had grown up. She told a colleague that an old lady there recognised her and even knew her name, which she said still appeared on the gas bill. This amazed us but it did not surprise Ksenia who was a firm believer in yuan, 'destiny, affinity, connection, cause', which I was always forgetting; "Frances! There is no such thing as coincidence!" Her work on the reconstruction of Tangut led her in various directions. Chinese sources are generally used side by side with their Tangut translations, but Ksenia stressed the independence and difference of the Tanguts. She also developed remarkable theories about Tangut thought, expressed through poetry and painting, as can be seen in her most recent studies. She was deeply interested in symbolism, which she often discussed with her dear friend, whose recent death had greatly distressed her. Ksenia was elegant, tall, upright and always beautifully dressed, her fair hair in perfect order, yet she was tolerant of those she liked. She must have had to remind me hundreds of times that coincidences did not exist but she did so with patience and I can still hear her. When I told Colin Chinnery of her death, Colin who liked and admired her, remembered fondly how she would address him and Sam van Schaik, "Boys!" To those she loved, she was a very good friend, and she was also a devoted mother to her two sons. It is enormously sad to think that she will not be coming back to the library to work on what she would prefer us to call the Mi-nia fragments since Tangut and Xi Xia were names 'used by those who had conquered them'. We have her notes and it is a great pity that she cannot finish her catalogue herself. Her devotion to her subject is evident from the fact that several of her essays will appear in the near future, in a volume to be published by the Circle of Inner Asian Art, in this IDP newsletter and in a collected volume being prepared in St. Petersburg by her son, Boris. Eric Grinstead, 'Tangut fragments in the British Museum', British Museum Quarterly XXIV (1961) and 'The Dragon King of the Sea, BMQ XXXI (1966-7). Dr Frances Wood is Head of the Chinese Section at the British Library. This major new catalogue describes the 2,500 Khotanese manuscripts in the British Library collection, including Buddhist and secular texts. It includes a comprehensive introduction to the collections and the historical background of the manuscripts. Postage free in the UK, overseas charged at cost. 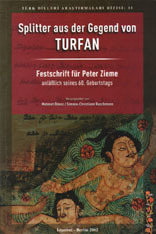 Another major catalogue to compliment that of the Manichaean fragments in Berlin, this excellent and comprehensive work describes all the 794 banners, many of them fragmentary, and includes an introductory essay by the author, as well as appendices by other experts. Asiatic Foundation, St Petersburg 2003 (in Russian), pp.165, 130 b/w ills. Festchrift für Peter Zieme anlässlich seines 60. Geburtstags. Euros47 (elsewhere, inc. surface mail). October 1, 2002, to January 5, 2003. 152 pp, 102 b/w ill., 17 colour ill. This is a catalogue of the EXHIBITION being held at Espsace Arluad, Lausanne, Switzerland from 28 March to 27 July, 2003. November 2002, 212 pages and many illustrations, $65 plus shipping. The theme of this year's long-standing PIAC is 'Daily Life in the Altaic World'. This conference will comprise symposia concentrating on different aspects of the theme, as below. The opening day, 8 September, is when the first Otani expedition organised the caravan at Osh in 1902. 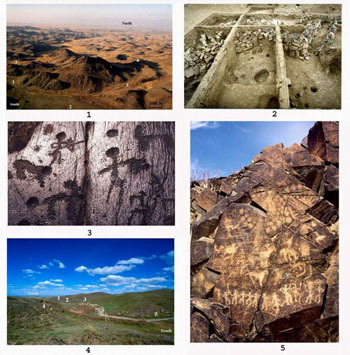 The Institute of Archaeology and the Institute of Geology of the Academy of Sciences of Kazakhstan, in cooperation with International Scientific Projects (ISP) will organize four volunteer camps this summer and early autumn: the first dedicated to the study of the transition between bronze and early iron epochs in the steppe and mountain zones; the second to the study of two medieval towns of East Semirechie; the third to the study of two millennia of water use in the oasis of Otrar; and the fourth to the study of the landscape culturalization of the Chu-Ili mountains by petroglyphs, cup-marks, stone henges and other ritual monuments. 1 - tour of Almaty; 2 - surveys and excavation works on site; 3 - field lectures on geo-archaeology, archaeology and history by specialist academicians. The volunteers and students will be lodged in a student hotel in Almaty and in country houses or tents on the field. The cost of the participation is between USD250 and 300 per week per person (min. two weeks). The price includes transport, food, lodging, and lectures. A supplement of USD50 is required for the invitation letter and registration in Kazakhstan. An additional charge to cover aerial recognition by microlight flights may be proposed. The schedule is chosen by considering the special climatic conditions of the sites and movement from one camp to another can be arranged. That this is a double issue of the newsletter reflects the success of the Project over the past six months: we have simply been too busy to produce a newsletter before. As usual, the Chinese newsletter is being published at the same time and it carries all information about conference, exhibitions and publications in China, as well as news of IDP in China. Both newsletter are available on the web and in hard copy. 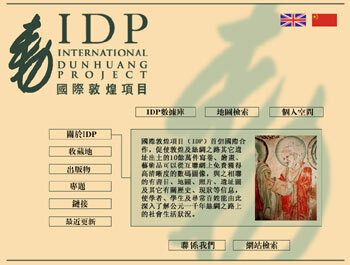 The redesign of the web site and its launch in Chinese and English versions reported on p.1 was the highlight of the past year, but the inclusion of images of manuscripts and paintings from international collections, including the National Library of China and the British Museum (see above), was immensely important as it confimed the 'International' in IDP. We look forward to making manuscripts and paintings from other collections similarly available over the coming years. This genuine international spirit was also shown in the very successful 5th IDP Conservation Conference held in Stockholm in October (see above). The next IDP Conservation conference will be in Kyoto in September (see Conferences) and the National Library of China will host a Dunhuang conference immediately afterwards (See Chinese newsletter). 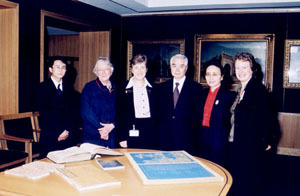 His Excellency Zha Peixin, Mme Zhang Xiaokang (Minister Counsellor) and Mr Liu Zhen (Attache, Political Section) visited the British Library on 26 March, 2003 at the invitation of Dr Lynne Brindley, Chief Executive (group pictured right). Following a tour of the Library, the exhibition galleries and Turning the Pages they visited the IDP Digitisation Studios and the Conservation Studio, before a meeting to discuss forthcoming exhibitions at the Library, namely Chinese prints and the Silk Road (see below). Following a successful application to the Art and Humanities Research Board Dr Jake Dalton (below left) was appointed to work on the cataloguing of the tantric Tibetan manuscripts from Dunhuang with Dr Sam van Schaik. 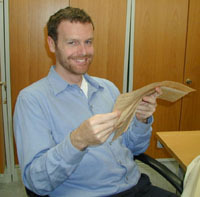 Dr Dalton recently completed his PhD at the University of Michegan on Tibetan Buddhism. IDP was delighted to welcome Ms Zhang Wenhui (pictured below right) as an intern working on the Project from March 2003 for one year, funded with a Chinese government grant. 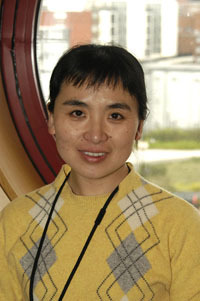 Ms Zhang is a subject librarian at the Institute of Archaeology, the Chinese Academy of Social Sciences, Beijing. She is interested to learn about all aspects of a digitisation project. Kate Hampson visited Paris in March 2003 to present the IDP web database and to discuss collaboration with the Musèe Guimet and the Bibliothèque nationale de France. Over the course of the past several months IDP staff have given lectures at many venues including ECAI (Osaka, September 2002); 'Turfan Revisited: The First Century of Research into the Arts and Cultures of the Silk Road' (Berlin, September 2002); 'International Conference on the Current Situation and Future Trends of Digital Library Development' (Beijing, October 2002); the International Association of Buddhist Studies (Bangkok, December 2002); Chinese Academy of Sciences (Beijing, January 2003); Hong Kong Universities' Libraries (Hong Kong, January 2003); Humanities Data Centre, University of Sheffield (Sheffield, UK, February 2003); and the Buddhist Society (London, March 2003). The British Library major summer exhibition for 2004 (April to September) will be 'The Silk Road: Trade, Travel, War and Faith' and will be curated by Susan Whitfield of IDP. Held in collaboration with the British Museum it will showcase the Stein collection at the British Library, the British Museum and the National Museum, New Delhi. Three hundred exhibits from these collections and from museums in China, France, Germany and japan will be on display in the main exhibition gallery at the British Library. There will be an accompanying catalogue, web site, educational programme and various events, including study days, lectures and a symposium. Further details will be given in IDP News.